Evan, Daniel, Danny, Sam, Corey, and Jay love what they do and work hard at being the best and most dynamic tribute band in the industry. Uptown Funk has been touring since 2016 nationally and internationally performing all the hits, including "24k Magic" "Treasure" and "Uptown Funk." No other rendition of Bruno Mars' music comes close to this band with their level of accuracy and unmatched attention to detail. Uptown Funk's stage production captures it all! 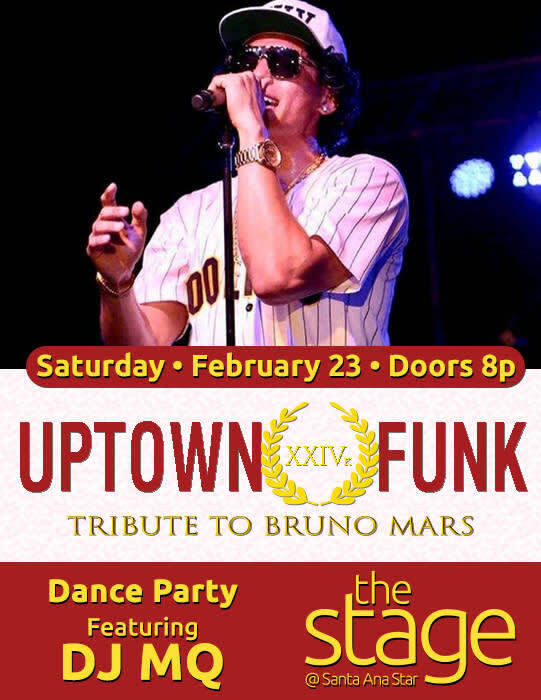 Uptown Funk features, Evan Saucedo, an amazing Bruno Mars impersonator who can really dance and sings every note LIVE! (and quite flawlessly at that) With an incredibly talented group musicians backing him up to bring you the best Bruno Mars concert experience! Together they provide an exciting mix of the Funk and Pop/R&B sound of Bruno Mars. Uptown Funk will guarantee to keep an audience on their feet!